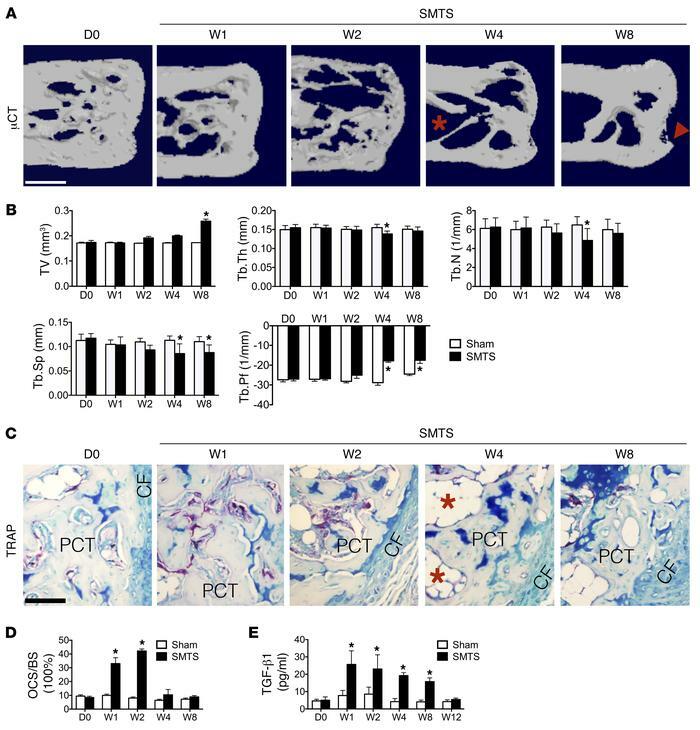 Osteoclastic bone resorption in SMTS enthesopathy mice. (A) μCT images of the PCT (sagittal view). Red arrowhead indicates altered morphology of the PCT. Red asterisk indicates bone marrow cavities. Scale bar: 500 μm. (B) Quantitative analysis of BV/TV, Tb.Th, Tb.N, Tb.Sp, and Tb.Pf in PCT determined by μCT analysis. (C) TRAP staining (magenta) in mouse PCT bone marrow. Scale bar: 200 μm. Red asterisks indicate bone marrow cavities. (D) Quantitative analysis of TRAP+ OCS/BS. (E) Quantitative analysis of active TGF-β1 in serum by ELISA. D0, prior to SMTS surgery; Sham, sham surgery; W1, 1 week after SMTS surgery. Data shown as mean ± SEM. n = 10. *P < 0.05 compared with the sham group.